Plum Hollow Road (County Road 5) at intersection with Lake Eloida Road and Hard Island Road . GPS 44.6464584,-75.9763449 CN Athens station moved from original site and used as residence. Highway 511 south of Calabogie, east side of highway CP Barryvale station, unused Need details of location. May be gone. NE of highway 29, 8720 County Road 28. 1.5 km north of crossing on west side. Approx. 1.2 km east of original site. 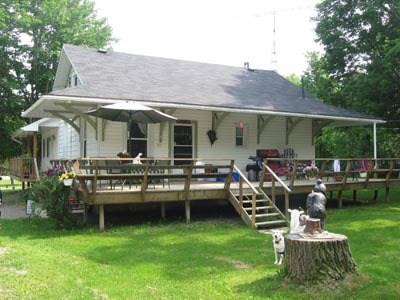 GPS 44.6940386,-75.8235937 Former CP Bellamy station used as a dwelling. Photo by Andrew Jeanes, 19 June 2012. North of Almonte right off hwy 15 on Blakeney Road on a farm near Blakeney CP former Snedden station, standard portable. In 1998 Railway station guide. 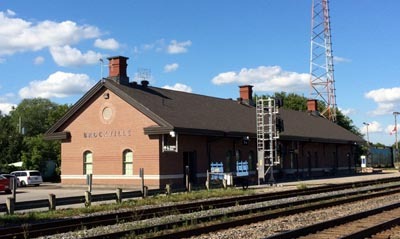 Brockville VIA (CN/GT) station in use by VIA and restored in 2015. 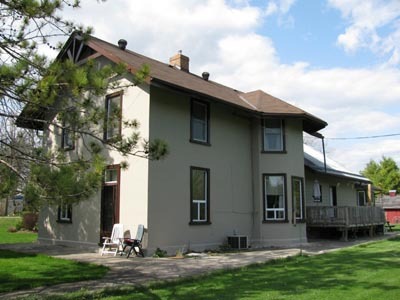 GPS 45.135913, -76.134735 Former CP Carleton Place Station, built 1921-22. No longer used as a daycare but more recently occupied by the Carleton Place Chamber of Commerce. 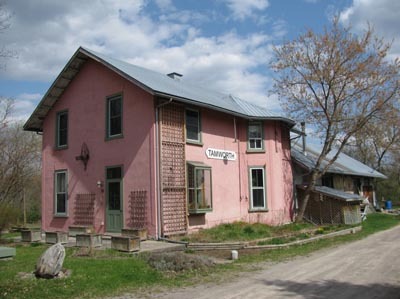 The chamber of commerce moved out as of early 2015, and the building is now home to the Ginger Café and Hamsa Yoga Studio. 2.4 km west of crossing CP Castleford station, In 1987 Guide. Need to verify. 8 km north off hwy 7 on hwy 509, east on Clarendon Road about 150 meters, on right side behind white house. GPS 44.873454, -76.696764 CP station in situ. 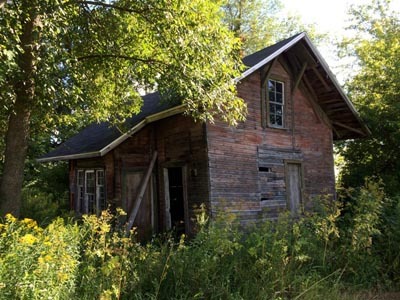 Former CN Vars Station, built by the GTR 1908-1909. 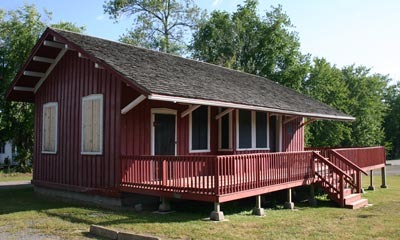 Relocated to the Cumberland Heritage Village Museum in 1976. Photo by Andrew Jeanes, 12 April 2006. 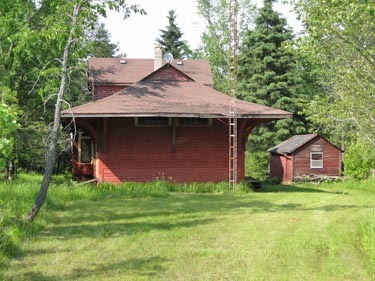 Former CN (CNoR) Cumberland Station, built by the Canadian Northern Ontario Railway in 1909. 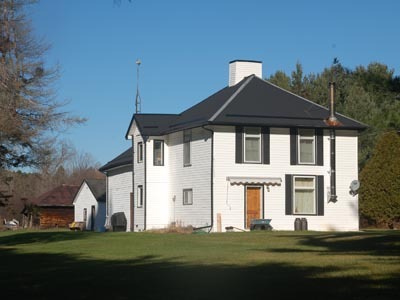 Relocated a short distance west of its original location and in use as a residence. 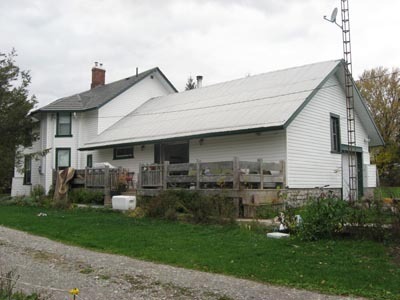 Junction hwys 15 and 41 CP stations from Bell and Story are used as farm buildings, In 1987 Guide. Need to verify. Eastons Corners, ON CP Yule station on a farm towards North Augusta In 1987 Guide. Need to verify. Highway 41 26.5 km north of highway 401 Former CN (BQR) station, Erinsville. No longer used by the municipal roads department but now in use as a community centre. Photo by Andrew Jeanes, 22 October 2011. GPS 44.217195, -76.754917 CN Ernestown Station, built by the Grand Trunk Railway in 1856. 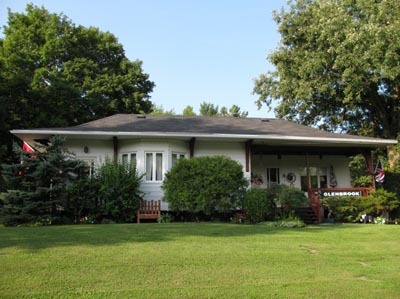 Its current ownership is unclear but it remains vacant and unused. Photo by Andrew Jeanes, 27 June 2008. County. Rd. #5 at Temperance Lake Rd. Note the official CP timetables showed "Fairfield" yet people in the area called it "Fairfield East". 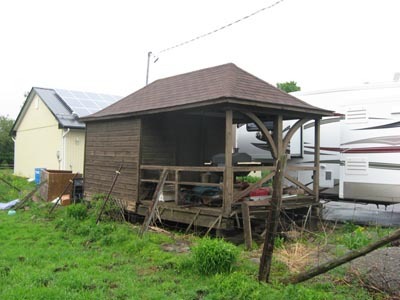 Former CP Fairfield (East) station, relocated away from right-of-way and in use as a shed. Photo by Andrew Jeanes, 21 May 2013. Photo by Andrew Jeanes, 21 May 2013. 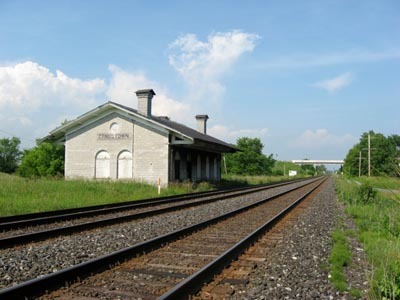 Former Brockville and Westport (later CNoR/CN) Forthton station. 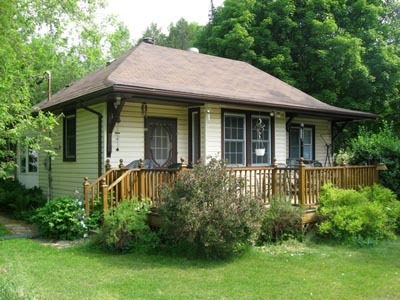 Built circa 1886, relocated a short distance from the former right-of-way and very deteriorated. North west of Brockville at junction of hwys 29 and 42 on north west cormer behind barn buildings. It is sitting beside the original roadbed, but turned perpendicular to it. West of highway 15 on Perth Road (County Road 10) east of CP crossing on north side. 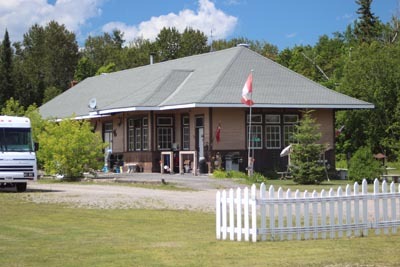 Former CP Franktown Station, moved a short distance away from the former right-of-way and in use as a residence. GPS 44.3685,-76.153432 CN/VIA Gananoque Station, built by the GTR in 1901. Still in railway use. GPS 45.1525218,-74.6244377 Former CP Glenbrook station, relocated away from the former CP Cornwall Sub. 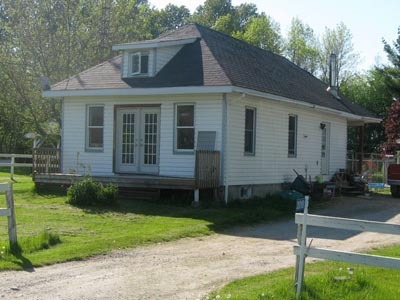 right-of-way and used as a residence. Photo by Andrew Jeanes, 22 July, 2010. 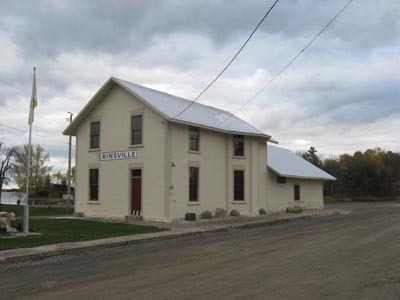 Glen Elbe, ON CN (BWSSM) Glen Elbe station was moved from original site and may still be in existence. More information and picture needed. Glen Tay, ON CP Glen Tay station name board in Petro Canada gas station In 1987 Guide. Need to verify. GPS 44.253834, -76.484709 CN Kingston "Outer Station", originally built by the Grand Trunk Railway in 1855 and used for passenger service beginning October 27, 1856. 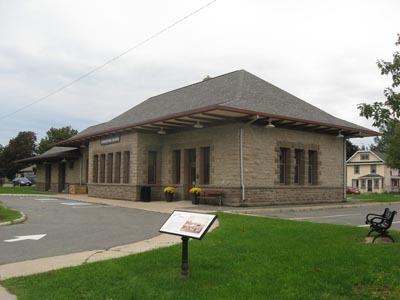 The brick building was built in 1895 and held the station's main passenger waiting room and operator's office for many years thereafter. 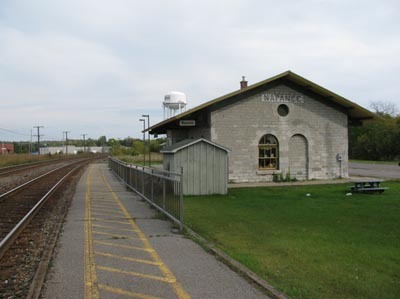 This station building complex closed for regular passenger use when the new CN station opened on October 27, 1974.Andrew Jeanes took this photo on December 21, 2014. 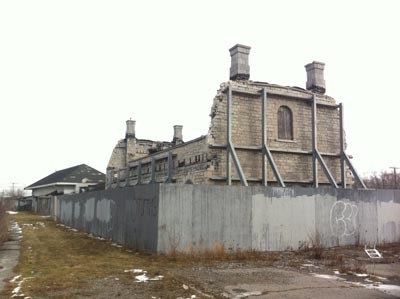 CN removed the burned-out and collapsed roof from the stone station building in April 2011. 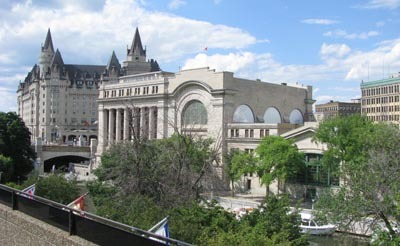 The former CN "Inner" Station, also known as Hanley Station (for the original station agent). 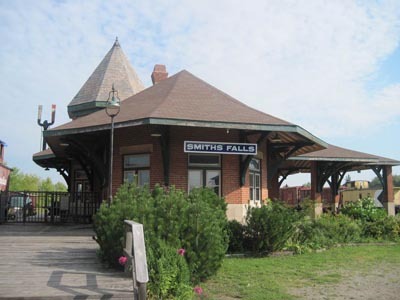 It was opened by the Grand Trunk Railway in 1885 and closed as a passenger station in 1930. Andrew Jeanes took this photo on June 10, 2007. 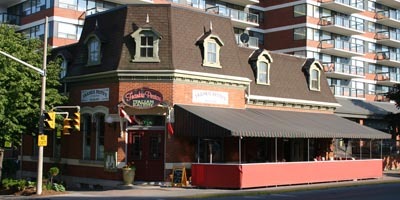 The building has served many purposes over the years but has been home to Frankie Pesto's Italian Eatery since at least the early 2000s. 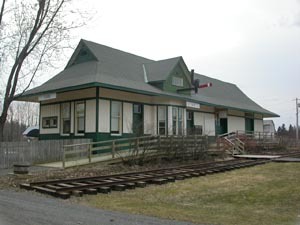 The former CP Kingston Station, originally built by the Kingston and Pembroke Railway in 1884. It saw its last passenger train on June 16, 1957. Andrew Jeanes took this photo on November 24, 2011. 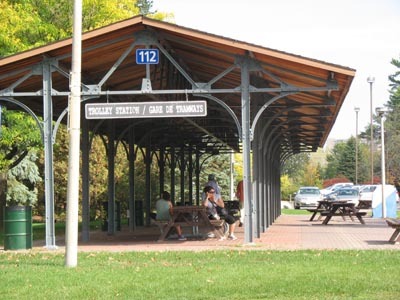 This station has been well cared-for and serves as a tourist information centre and gift shop in Confederation Park, across from Kingston City Hall. 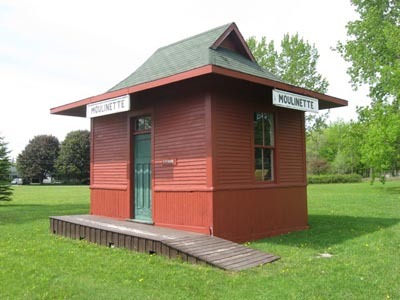 GPS 45.032899, -74.853495 Former CN (ex-GTR) Moulinette station, relocated to Lost Villages Museum in Long Sault. Photo by Andrew Jeanes, 25 May 2014. Madoc, ON CN (BQR) Madoc station in situ. In 1987 Guide. Need to verify. 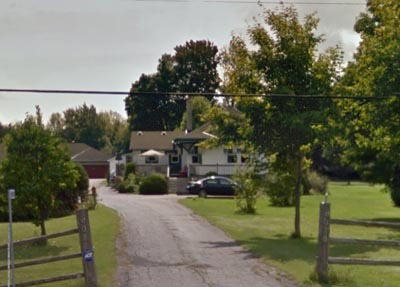 GPS 45.253235,-75.630877 CP Manotick station, used as a dwelling and moved from original site. 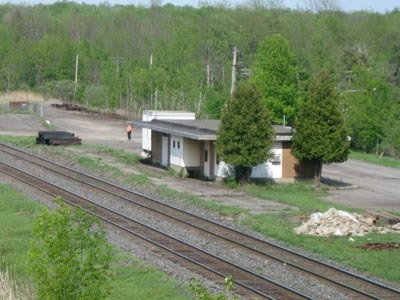 Former Central Ontario Railway (later CNoR/CN) Marmora station. 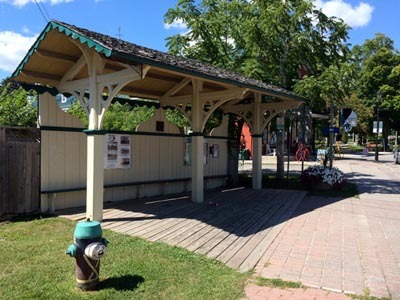 Relocated to a park in Marmora. Photo by Andrew Jeanes, 6 July 2007. 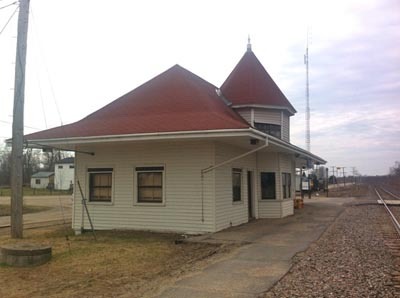 Mississippi, ON CP (K&P) station in situ, dismantled, moved to private property. GPS 44.914184, -75.192676 CN Morrisburg station, built in 1957 and still in active railway use as a MOW base. Photo by Andrew Jeanes, 25 May 2014. 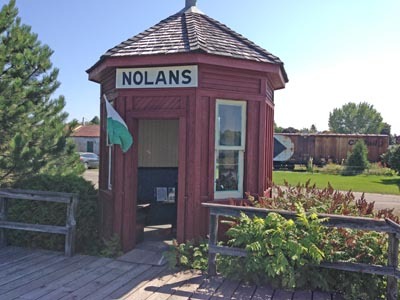 GPS 44.253475, -76.954487 CN/VIA Napanee Station, built by the Grand Trunk Railway in 1856. 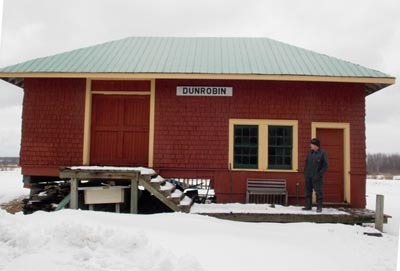 Now owned by the town, with half the station occupied by a woodworking studio. Also in railway use. Photo by Andrew Jeanes, 18 September, 2010. 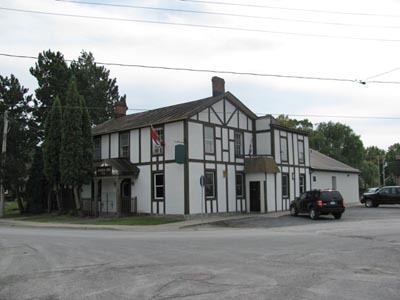 Former CN (BQR) station, Napanee, relocated a short distance from the tracks and in use as a pub. Photo by Andrew Jeanes, 18 September 2010. Newburgh, ON Former Bay of Quinte Railway station, Newburgh. In use as a residence. Photo by Andrew Jeanes, 20 April 2010. GPS 45.424807, -75.694157 CN (GTR) Union station, Being converted for use by the Senate, formerly government conference center. 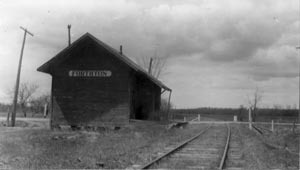 Ottawa, Gloucester, ON Part of CN Blackburn station moved to Maxime Street. In 1987 Guide. Need to verify. West off highway15 in Pakenham on to White Fish Lake Road, ½ km west to Five Arches Drive at end of street on left hand side. 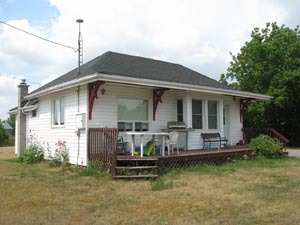 Former CP Pakenham Station, moved a short distance away from the former right-of-way and in use as a residence. Photo by Andrew Jeanes, 15 September 2013. GPS 44.710798, -75.524798 CN/VIA Prescott Station, built by the Grand Trunk Railway in 1855. 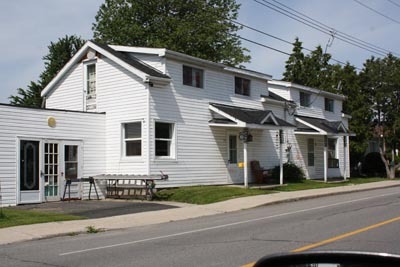 Now occupied by the Grenville County Historical Society. 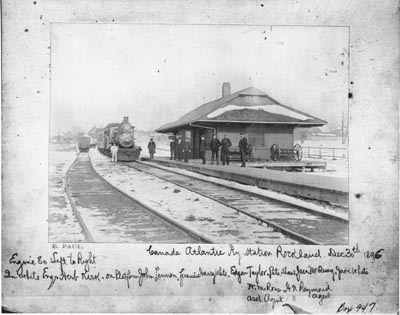 CAR station Rockland 30 December 1896 with locomotive 80. GPS 44.905513, -76.017275 Former CP station in situ. 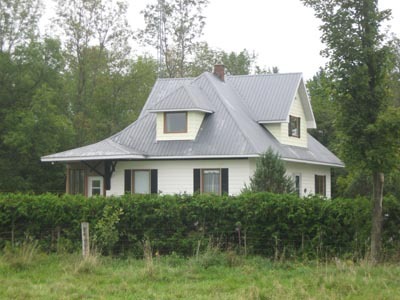 On county road13 3 km south of Tweed on north side and west of Stoco CN (BQR) station, in situ and used as a dwelling. Photo by Andrew Jeanes, 18 March 2012. Southwest corner of village. Former CN (BQR) station, Tamworth, in situ. 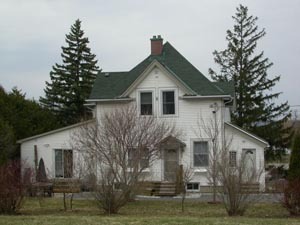 In use as a residence. GPS 44.940387, -75.094757 Former CN (ex-GTR) Aultsville station, relocated to Crysler Park, Upper Canada Village. Across Highway 7 from the OMYA calcium carbonate plant in Glen Tay, about 6 km west of Perth. 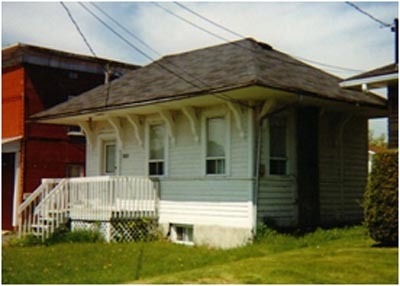 Former CP Bathurst station now a residence. This was moved about seven kilometres *east* to Glen Tay. 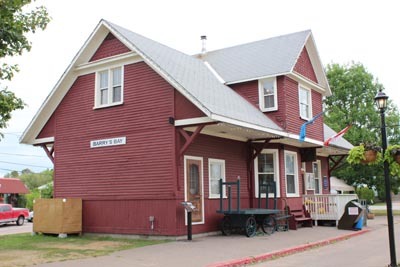 Bathurst remained a station name on CP employee timetables at least into the 1960s, however the local post office changed its name to Wemyss much earlier than that, supposedly to avoid confusion with Bathurst, NB. There was never a CP station named Wemyss. The two station buildings 3.7 miles apart (railway distance) managed to each be relocated to the other's approximate former location. Photo by Andrew Jeanes, 28 May 2012. 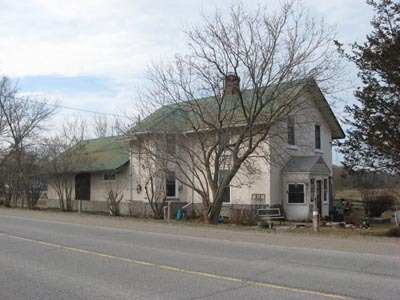 Just south of Highway 7 and the former Havelock Sub right-of-way, west of the Bathurst 5th Concession Road. 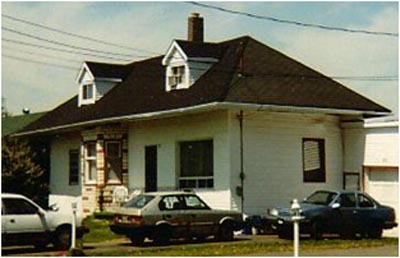 Former CP Glen Tay station, relocated to Wemyss and used as a residence. 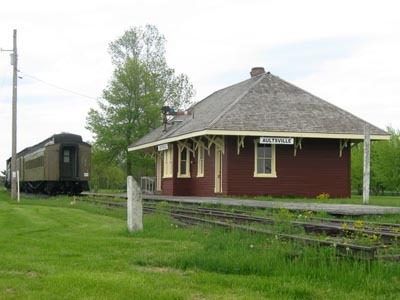 There is confusion about the surviving stations around Glen Tay. 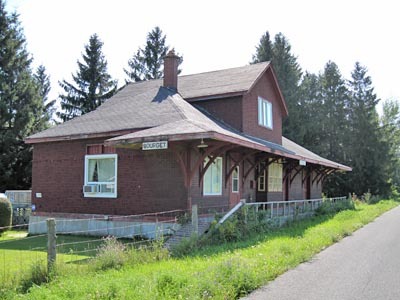 There are two: Glen Tay itself, which has been moved about seven kilometres *west* to Wemyss and Bathurst (see above) There never was a CP station that had the name Wemyss. Winchester, ON CP Winchester station, used as a dwelling and moved from original site. In 1987 Guide. Need to verify. Yonges Mills, ON CN (GTR) design flag station moved to a farm In 1987 Guide. Need to verify.